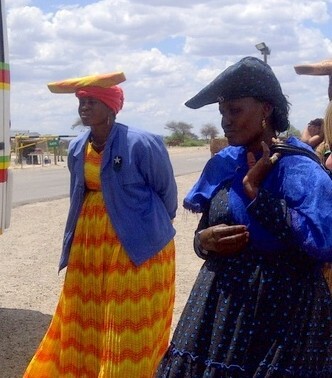 One of the things I love about Botswana is the way people dress. I‘d like to say there are no rules here. You can wear whatever you like. Actually, there are rules, it’s just you only have to follow them if your circumstances allow; and the rules are different from the US. There seems to be an attitude of, “if you have it, wear it.” Don’t hold clothes back for a special occasion like a fancy dinner or a formal event. Wear those satin and rhinestone heels from your wedding to work – you own them, you may as well wear them. One of my coworkers shows up in form-fitting lacy tops with jeans & stiletto heels many days. She is beautiful and looks awesome. In the US, you would think she’s heading to the nightclub for an evening of partying. 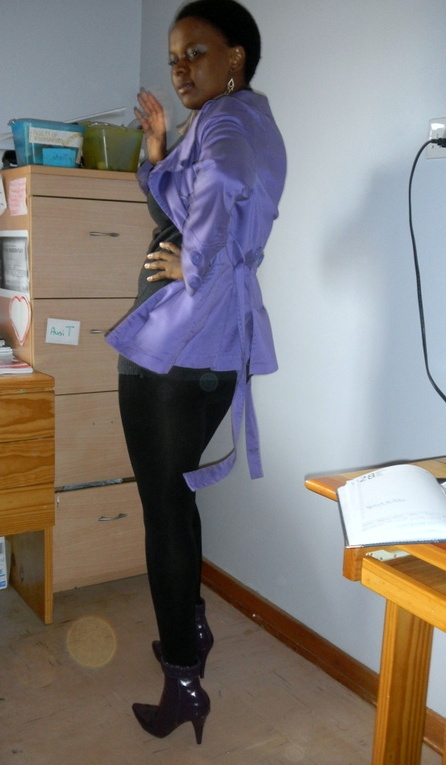 Here in Botswana, it’s a nice outfit, she likes it, so she wears it to work. I just don’t get the walking on uneven, rocky dirt roads with loose hot sand in stilettos. Ouch! Dressing well is a reflection of respect for yourself and for others. 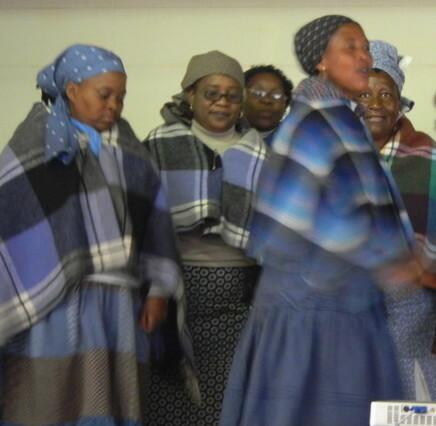 If you go to the Kgotla to discuss something with the Kgosi (the Chief), men must wear jackets and women must wear long skirts and have their shoulders covered, usually with a traditional shawl. Wearing starched & freshly ironed dress shirts with dress slacks and smartly polished shoes is important for men going to work. High government officials or prominent business men always wear suits and colorful ties and elegant shoes, even when the African sun is blazing hot and you sweat standing still in the shade. One interesting fashion trend here is that men tie their ties very short, where the tip of the tie hits them way above the belly button. It looks comical until you get used to it. Business women wear accessorized suits or fashionable dresses with heels and carry large designer handbags. If you are educated and employed, you dress to reflect your status. School age kids wear uniforms to school. 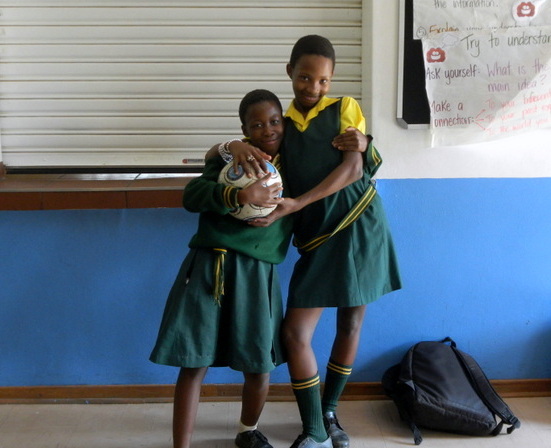 The uniforms vary in color based on the school, but the overall style is the same for all schools throughout Botswana. 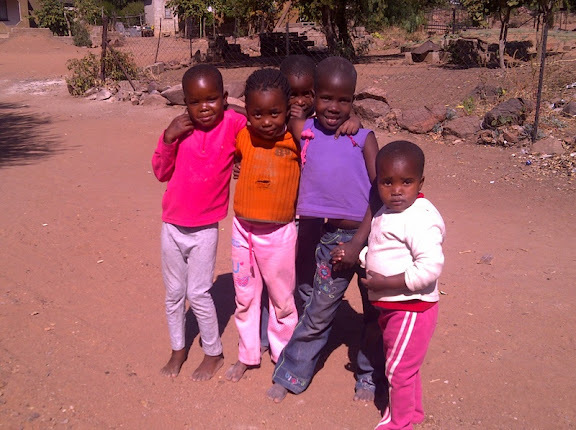 The kids who attend Stepping Stones are orphans and vulnerable children, who come from economically disadvantaged homes. For these kids the government provides a new school uniform every two years, but I’m not sure they really get them. Wearing the same, one uniform, day after day, results in some raggedy clothes and ill-fitting shoes. Frayed collars, holes in elbows, hand stitched repairs, missing buttons are the norm. Boys wear belts that wrap around their waists and end in the middle of their backs, they are so large. Feet outgrow shoes and kids walk with the back of the shoe folded down so they can continue wearing them. 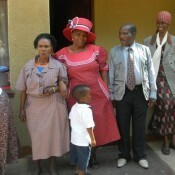 On special days, the school uniforms are left at home and the kids get to wear their “play clothes”. These are the days I love. Kids wear what they have, and they don’t have much. Boys wear their sister’s shirts; who cares if it’s hot pink with a scoop neckline and belled sleeves. Plaids go with stripes. Sparkly tops with leggings – that’s okay. Length of trousers and shirts is not an issue; a little on the short side, wear it anyway. Shoes are optional. You don’t need athletic shoes to play football (soccer) on a dirt field. Bare feet work fine. No one teases or pokes fun at someone else’s clothes. They are all in the same boat, struggling to stay afloat. As far as undergarments go, many are luxury items. We in the US go out and purchase “training” bras for our pubescent daughters. 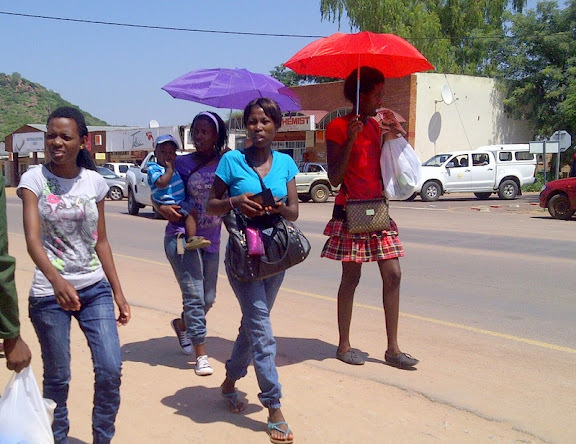 Here in Botswana, many women never have a bra. Breasts of all shapes and sizes hang free under t-shirts and satin blouses alike, whether you are 13, 33 or 83. The well-educated, employed business women wear them, because they can afford them. If a mother has to choose between a bra and feeding her children, she buys the food. Slips fall into the same category – virtually non-existent. 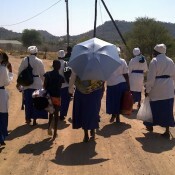 The African sun shines straight through cotton skirts, revealing the outline of long legs. Maybe some of this is due to the heat. Eliminating non-essential layers helps one stay cooler. As for underpants, those are essential, just like in the US. I don’t think many people do without those. Except toddlers. Most days on my walk to work, I’ll pass a compound with a toddler in the yard wearing only a shirt, naked from the waist down. It makes potty training simpler, there are fewer clothes to hand wash.
Another essential clothing item is a hat. 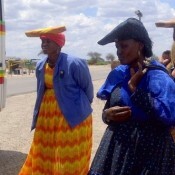 The African sun can be brutal, so hats are worn for protection from the sun, not for fashion. Bucket hats, safari hats, fedoras, knit stocking caps, fancy brimmed straw hats for ladies, and an occasional baseball cap are commonly seen. Sometimes just a rag on your head will do. Many ladies, especially middle-aged or older, wear colorful scarves wrapped around their heads. 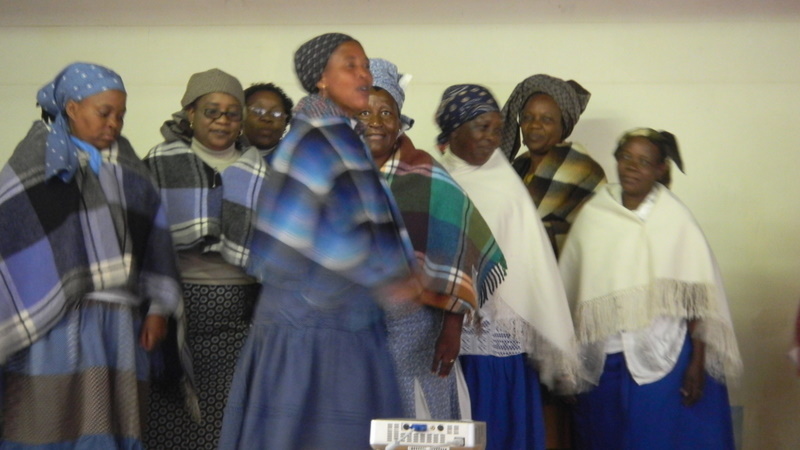 The older women are some of my favorites when it comes to how they dress when they are out and about at the Mochudi shopping area called “the mall” or “the shops.” They typically wear wrap skirts made of traditional German print fabric, that fall below the calf. Many of them wear striped socks, think Wicked Witch from Wizard of Oz, and sensible lace up shoes. Their top might be a T-shirt or button up blouse, which may or may not be color coordinated to go with the skirt. And the head scarf completes the outfit. It’s modest, comfortable, functional, and sometimes pretty funny looking. I love it. For special functions, like weddings, funerals, or any type of celebration, many women wear dresses made of the traditional German print fabric. The dresses are custom-made and may be very simple with straight lines, or very elaborate with satin ruffles, and form-fitting designs that hug shapely curved buttocks. They will be worn with matching head scarves, fancy heels and jewelry accessories. In cooler weather, a tradition shawl in a coordinating color will be added for warmth. However, most of what you see looks just like what we wear in the US. Jeans with t-shirts, sun dresses with sandals, buttoned down, collared dress shirts with khaki pants, are very common. Dressing smartly is valued in Botswana, especially in the workplace. But I do see friends wear the same shirt and pants every day for a week or more, because it is the only nice outfit they own. That is different. 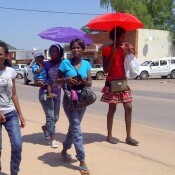 That is real life in Botswana. 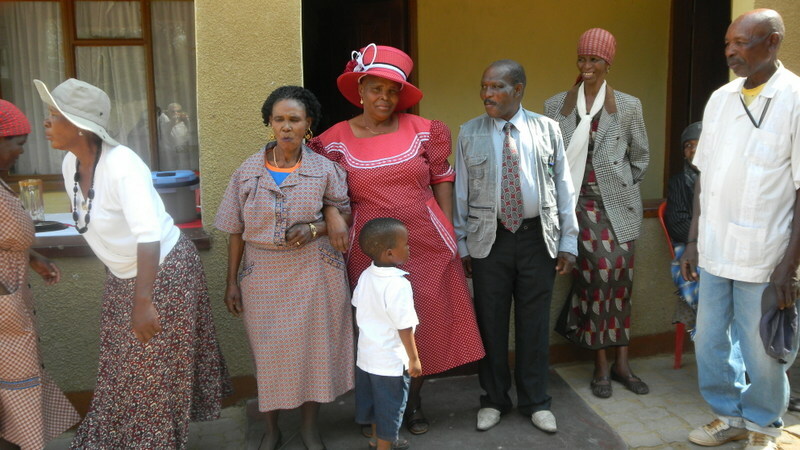 This entry was posted in Peace Corps, Service - Year 1 and tagged african dress, Botswana, clothes, fashion, Mobley, Peace Corps. Bookmark the permalink. I think this blog is wonderful. My nephew spent a year bicycling through Asia and had a blog. This was most exciting and and educational. I am so glad that you would include me in your blog. Take care and I will look forward to your next chapter. I don’t know whether to take this as a compliment or an insult. It seems like this article was written by a US person, and that person is trying to say that the US people are far much better than Batswana, the writer is trying to look down upon batswana and their culture. Or the writer loves Botswana and is writing out of love, I dont get it. Either way this is too explicit, hurting, touching and sad to an extent because is like every little piece of Botswana is here (naked). Its all true but….. Thank you so much for these wonderful pictures along with what has been written. I am trying to learn more about this world where so many of us are alike but different in beautiful ways. I am American but recognize that only by learning more about our world will any of us be part of the human quilt that holds us all together. I cannot board a plane and just go find these places and people who can teach me so much. I am appreciative of technology that brings us together in a way we never could have in the past. I would like to show other cultures that not all Americans are spoiled brats who insist on having their way. There is too much beauty out there for us to stay cocooned in our own beliefs. Is it acceptable for women to show their knees? Yes… we saw women whose knees were showing. 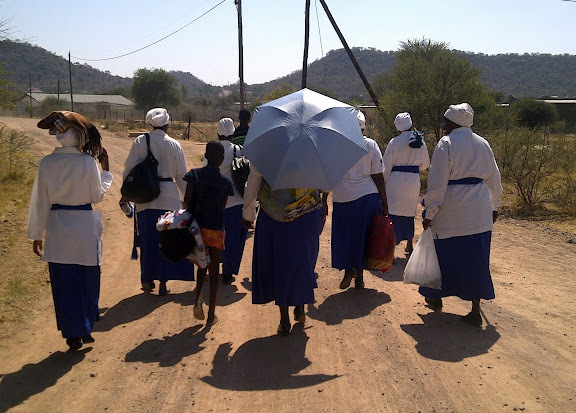 Prior to arriving we were told that Botswana was quite conservative and exposed knees and shoulders would not be appropriate dress for women. The reality was quite different. I’m a fashion design student and would love to hear some more about the part you wrote about kids wearing “play clothes”. where do these “special days” take place? in what schools? is it in the school calendar ? how often? does it have anything to do with running out of school uniform (washing)? 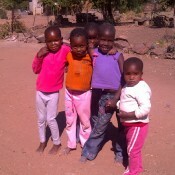 do you have any photos of these kids, i would love to see some and use them as my inspiration!